As someone who has been in the U.S. for almost two decades now, Don Tagala surely knows a thing or two about the social, political and economic climate there. An alum of the University of the Philippines Manila with a bachelor's degree in biology, Tagala would go on to become a news correspondent for ABS-CBN International's Balitang America — a profession which has since then enabled him to do what he has always been wanting to do: to tell the stories of his fellow kababayans abroad. "I like telling the untold stories of everyday Filipinos, ordinary Filipinos who did something extraordinary, the struggles of migrant workers, the struggles of the members of the LGBT community, stories of Filipinos who were victims but fought back and stood up for their rights, the triumphs and defeats of athletes and sportsmen," he says. 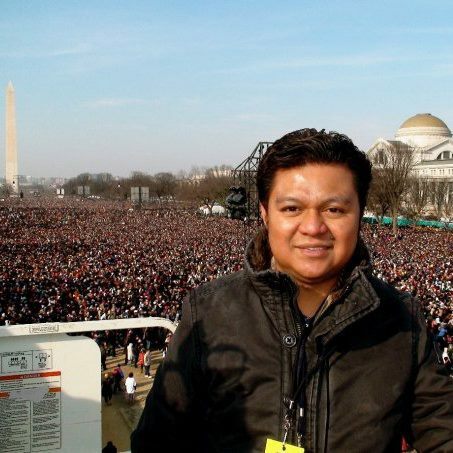 In the years since joining ABS-CBN News, Tagala had witnessed some of America's most historic (inaugurations of Barack Obama, the 2008 presidential election cycle) and tragic news events (aftermath of Hurricanes Katrina, Ivan, Rita, Dennis, and the Sandy Hook school shooting), making him one of the most trusted and reliable names in global news. For our brand new MNP Q&A, this multi-award winning journalist talks about how he got his start in the news business and the many eye-opening stories and events he was able to cover. Be sure to be part of the discussion by tweeting us @medianewserphil or posting your comments below or on our Facebook page. Guiding Principle: Possibilities are as endless as your imagination. Tell our readers your story. Who is Don Tagala? Here's a nomination letter written by Nelsie T. Parrado — UPAAA Liaison Officer, East, Past president UPAAN, that I thought sums up my work. I hope this gives you an idea of who I am. I have the honor and privilege to nominate Mr. Adonis “Don” Tagala for the 2015 Distinguished Alumni Award in the field of Journalism. 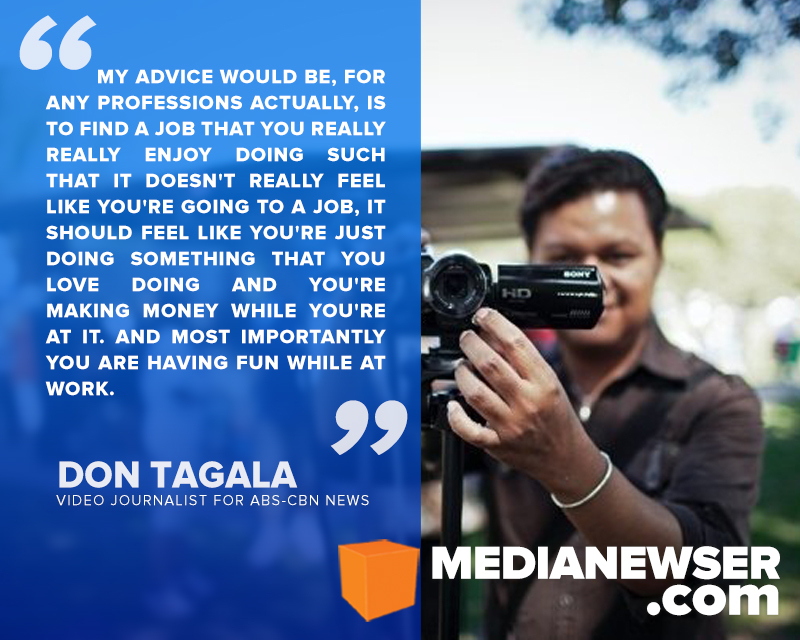 Don, as he is called by his peers and his friends, is an award-winning Video Journalist of ABS-CBN North America Bureaus’ Balitang America. In his chosen field of journalism, he is well respected by his peers, and his contribution to the dissemination of information affecting the Filipino Americans across the United States through the magic of television, are exemplary. Whenever important issues that would impact the Filipino American communities, he is there to cover and report to the larger audience in America, as well as in the international market, where The Filipino Channel has affiliates. Don Tagala started his career as a video journalist in the U.S. in 2002. 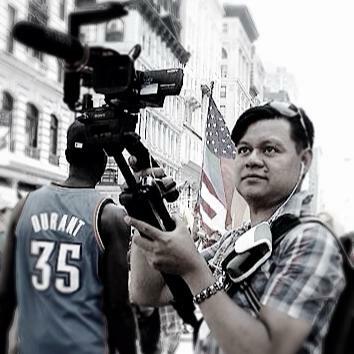 Prior to entering the field of video journalism, he worked as a Clinical Research Coordinator at the Chicago Center for Clinical Research, where he was able to practice what he studied at the University of the Philippines. He finished Bachelor of Science, major in Biology in 1993. But as a young graduate, he knew his passion is in journalism, with television as the medium. He began his television career as a Science Researcher for Sineskwela, a children’s science television show produced by ABS-CBN Broadcasting Foundation in 1994. It was during this stint that Don gained television skills and expertise, and poise in front of TV cameras while appearing in guest roles in some episodes of the Science TV show. He was later promoted to Science Research Coordinator. His media production skills proved helpful in producing non-science related television program such as Bantay Bata 163, a 24 hour rescue and rehabilitation program of the ABS-CBN Foundation, supervising post productions, conceptualizing and directing some live events for both Sineskwela and Bantay Bata 163. His rise in his chosen field continued, and when ABS-CBN International begun to produce its own shows in San Francisco, Don continued to work for the network as a news correspondent for the “The Filipino Channel” as a correspondent for The Global Filipino and eventually Balitang America. The 30-minute news program airs in North America, Europe, Asia, Middle East, Australia and the Pacific islands. With this worldwide audience, his reporting of news and events naturally help the overseas Filipinos form opinions and act on pressing matters, such as when disasters visit the Philippines. As a testament to his excellent body of works, Don has been recognized and given awards. Most recent was his two 2015 Bronze Telly Awards at the prestigious 36th Annual Telly Awards, for his documentary Casting Call: The Story of Sam Milby. The same documentary, Casting Call, also won the 2013 Plaridel Award for Best Documentary. The other bronze Telly Award was the online video “Social Responsibility: Why a Filipino-American is Giving Free Haircuts to the Homeless”, a story of a Fil-Am hair designer who spends weekends giving free haircuts to the homeless in New York City. In 2012, he also won a Bronze Award at the 33rd Telly Award for his story titled “The Filipino Champion: “Armless Pilot”. Which tells of the inspiring story of a Filipino — American, Jessica Cox, who was born without arms but was determined to overcome the obstacles of her physical limitations, became a motivational speaker, and the first armless licensed pilot to fly an airplane. Jessica Cox is also a scuba diver, sky diver, surfer, among others. 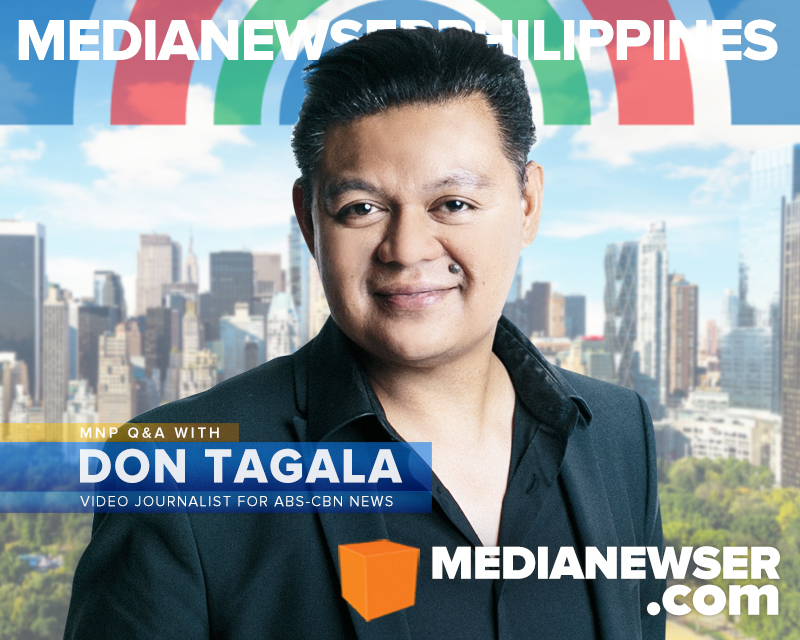 Don Tagala was the New York segment producer for another Telly Award-winning special — “Global P-Noy Town Hall sa TFC”, which won another Bronze Award at the 32nd Telly Award in 2011. This award winning a special featured President Benigno Aquino lll in a multi-platform town hall meeting, interacting with live audience in the TFC studio in Redwood City, California and with viewers in remote live points in America, Canada, Dubai, Japan and in the United Kingdom. 2012 was a banner year for Don Tagala. He received a Leadership Distinction Award for Excellence in Broadcast Journalism from the Honorary Consul General of the Philippine Consulate of South Florida. He was also presented with a Citation of Honor by Helen M. Marshall, Queens Borough President, New York, for Excellence in Journalism. I can go on and on extolling his many recognitions and awards. All testaments to the kind of work ethics and professionalism he has consistently practiced since embarking in the field of video Journalism. Since I have met and known him up close and personal, I have admired his willingness to cover events worthy of sharing to the Filipino-American Community he has so well served since graduating from the University of the Philippines. He is a valued Video Journalist/News Correspondent of ABS-CBN International News covering New York/New Jersey, but now can be seen also being assigned to other locations being served by the network. I strongly believe that Mr. Adonis “Don” Tagala has brought about substantial benefits to the larger society we live in, as well as distinct honor to our alma mater, the University of the Philippines. His contribution in his chosen field of endeavor, video Journalism, has created an impact on his worldwide audience – here in the United States, in Europe, in the Middle East, in Asia and in Australia. He certainly is qualified to be considered favorably for the 2015 UPAAA Distinguished Alumni Award in the field of Journalism. What fueled your desire to join this business? From the Philippines, I moved to Chicago in 1997. Sometime in early 2000 I saw my former colleagues from ABS-CBN Foundation reporting for the magazine program The Global Filipino on TFC and I told myself, I would like to be part of this program and I would like to tell the stories of Filipino-Americans in the Midwest. In your own words, what is journalism for you? Journalism, for me, is more than just reporting the news — it's all about telling a story in the most compelling and most interesting way possible without sacrificing accuracy and facts. Journalism is not just providing accurate facts but it's also about making sure that every information you feed your viewers or readers matters to them. That these information could somehow impact their lives one way or another, such as making an informed decision when it comes to elections, such as choosing the right candidate for them. I also write to create awareness on certain issues such as human trafficking, labor abuses and human rights. What's the most rewarding thing about working in the news business? To tell the untold stories of Filipinos in the U.S. and make a difference in their lives and the lives of those who happen to see my stories. Tell us about your own approach in storytelling. Tell the story as it is while still making it visually interesting at the same time use lots of natural sounds, whether from a performance, street protests, etc. and use compelling soundbites. The video itself should already tell the story. What stories or news events had the biggest impact on you and why? I lived in Biloxi, Mississippi from 2004 to 2006. I was there when Hurricane Katrina and other hurricanes pounded the South. Walking the streets of Biloxi and eventually New Orleans in the aftermath of Katrina, showed me first hand the devastating power of wind and water. I was in the middle of it all — Katrina, Ivan, Rita, Dennis, among others. The experience of living in ground zero taught me how hard it really was for people to live and survive in the midst of these disasters. I saw the destruction, I saw what it did to the people of the South. I saw its effect on people. But I also saw the resilience of people who were impacted by the calamities, I saw how these cities picked up the pieces and recover from a major devastation. So when I reported these stories, my POV [point of view] came from a personal experience because I know exactly what most people were going through because I was one of them. Today, telling a story about a calamity or disaster is personal because I have gone through a few of them myself and I feel that I have some knowledge of what people are going through so it taught me how to be sensitive when asking certain questions to the victims of such calamity. "Journalism, for me, is more than just reporting the news — it's all about telling a story in the most compelling and most interesting way possible without sacrificing accuracy and facts." Is there any journalist that helped shape your view as a journalist? When I started reporting as a backpack video journalist, it was really tough. Shooting, interviewing, doing everything pretty much by myself can be very challenging in the beginning. I chanced upon a book called "Dispatches from the Edge." — Anderson Cooper's memoir of wars, disasters and survival. Aside from reading how Anderson, as a journalist, captured the horror of what he saw, how he packaged it and presented it to others on a video package, I also saw how he did everything by himself as a backpack journalist or what we call now a video journalist. I thought to myself, if Andy can do it, so can I.
I admire his style, the way he thinks, the way he tackles issues and the way he tells his stories. While he tells stories as it is, he's able to come up with a balanced story. He doesn't really have to sensationalize his story to get the message across. When I watch him on CNN, I believe in what he says, I trust him, so I like it that he comes across on TV as such. His stories are simple enough for everyone to understand what he is talking about. He uses for the most part, simple words and it's easy to understand his stories. Interesting that you mentioned that. Anderson is known for his "emotional but sincere reporting style." Some call it "emo-journalism." What do you think about that? Do you think it's a no-no for journalists? When I covered the Sandy Hook School shooting in 2012, I wasn't prepared for it and I have no expectation whatsoever. All I know was that there are Filipinos in that area so I must tell their stories. When I first set foot on Ground Zero, just being there was overwhelming emotionally. I still even get choked up as I write this response. I already knew what had happened but when I saw the candles, teddy bears, flowers, cards — tons of them, piling up right before my eyes, I couldn't help it, tears started flowing as I shoot my B-rolls. And when I started interviewing subjects at the makeshift memorial area, it was impossible for me to hold the tears back. I have learned to control my emotions as I thought I have seen and experienced so much already as a reporter... but every time a subject who is either a victim of human trafficking, abused worker or someone who is talking about the loss of a loved one, I still find myself discreetly wiping tears running down my cheeks. Just like when I hear stories of victims of human trafficking and wage theft. One subject told me how she spent her life savings and even borrowed thousands of dollars just to pay those placement fees, immigration fees, airline tickets and was promised a job that pays $15, only to find out that she was conned. She did make it to America but she was getting paid below minimum wage and sometimes she does not even receive a single cent at all, then her work visa expired (not her fault, it was not renewed by employer) and she became undocumented. No work, no money, no food, and she still owes a ton of money from loan sharks. The hardest part is that there was no way for her to pay back the money she now owes. I felt her pain, in her voice, on her face, in her gestures. Tears started to flow from my eyes. I can't help it. It's a good thing that I don't really have to do live interviews for now. Most of my interviews are pre-recorded. If I had to do this on live TV, I would have cried my eyes out just like Anderson. I really don't want to call it emo-journalism, I simply wanna call it being human. How would you describe Ging Reyes and Nadia Trinidad? What did you learn from them that made you the journalist that you are today? I consider Ging Reyes as my mentor. Ging was the very first ABS-CBN News staff I ever met in person. I was already corresponding from Chicago for Balitang America and previously for The Global Filipino yet I never had a chance to meet anybody from the news team in San Francisco. When she came to Chicago for a coverage for the first time, not only did I get to meet my news bureau chief, I also got to see her in action. From covering a story, interviewing subjects, writing and editing her story to recording her voice overs — I watched her in awe. In my mind I was like, "so this is how you do it." I saw her commitment to the story's integrity. I saw how she gets the facts right. I saw how she digs up information from various sources. I saw how she deals with people. I saw how she manages time and makes the most of her trip and how she finds other side stories other than what she was there for. I saw how professional she is when dealing with the Filipino community. I learned everything first hand from one of the greatest storytellers of ABS-CBN News. Shadowing her was better than going to journalism school, that was real life on the job training, you just can't get that from any journalism schools. News Bureau Chief Nadia Trinidad, just like Ging, is also a mentor and a great storyteller. I'm fortunate to have directly worked with Nadia in out of state coverage as well. Aside from learning the basics, I also learned from Nadia that there is always a better way of writing your story. Having her edit my story, I saw how she's able to write it shorter but more effective. Her style of writing enhances my story. I also learned from her that there's always an easier way of doing things... I don't have to kill myself finding that story or subject. It made my life easier. 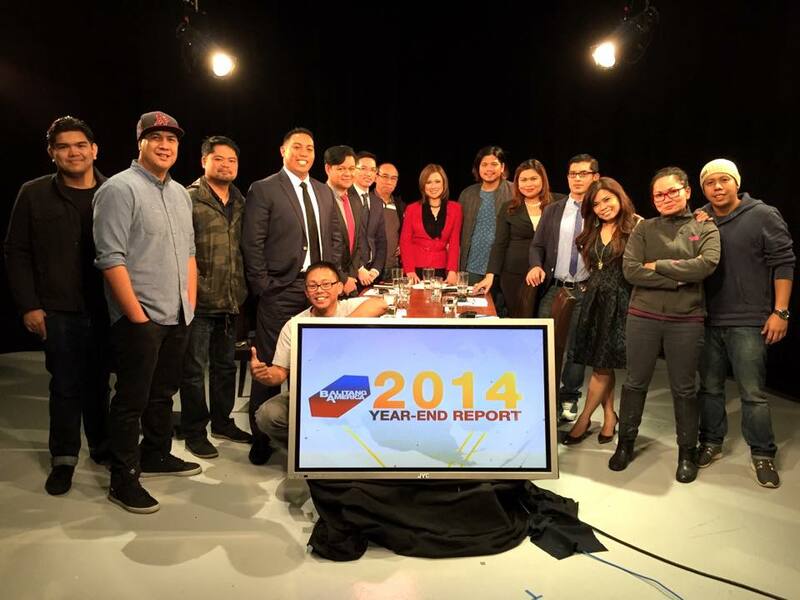 of the program's 2014 yearend special. Do you think reporters should be jack or jill of all trades like the Balitang America reporters? Meaning to say, journalists who can produce, write and shoot their own reports. I used to have a cameraman when I started reporting for The Global Filipino and Balitang America. It's always great to have at least another person with you during coverage. But as I got busy with more stories coming my way, it became challenging to coordinate with a cameraman who was also working full-time for another job. So instead of relying on another person to shoot videos for me, I started shooting videos myself. That sort of started the trend of being my own cameraman. Then we labelled it as video journalist. It worked out really well for me. I can get an advisory and get going in just a few minutes. For example when Osama Bin Laden was killed in the middle of night, I jumped out from bed packed my gear and was at the World Trade Center in a matter of minutes to cover the growing number of people celebrating the death of a most wanted terrorist. And with just a backpack that contains all my equipment — camera, lights, mic, macbook pro, portable wifi — I can actually send a story from anywhere in the U.S. as long as there is decent wifi coverage and electricity to plug it in. The beauty in knowing all the aspects of news reporting is you can drop me off anywhere in the U.S. and as a video journalist, I can cover, produce and send a full story package all by myself in a matter of at least an hour. I have covered an event at 1:30 PM, send everything (script, materials, voice over) to SFO by 3PM and it was aired on www.balitangamerica.tv live by 3:30ish PM. It can be challenging sometimes but I feel like it's an accomplishment every time I watch the finished product aired on TFC or on ANC or via live streaming. "I have always believed that you can't argue with success. It doesn't really matter whether you're gay or straight, black or white, ugly or beautiful, short or tall, or whatever defect or imperfections you have but if you do your best and show them that you got what it takes to do your job and do your job extremely well — then your sexuality wouldn't even matter." What stories are you most passionate about to report on and why? And also, what do you like most about covering the stories in New York? I like telling the untold stories of everyday Filipinos, ordinary Filipinos who did something extraordinary, the struggles of migrant workers, the struggles of the members of the LGBT community, stories of Filipinos who were victims but fought back and stood up for their rights, the triumphs and defeats of athletes and sportsmen. I first met Jhett Tolentino as one of the most outspoken victims of a Pinay con artist dubbed as the Filipino "Madoff" of New York. Jhett was a victim of a $3million+ ponzi scheme perpetrated by Razel Canedo. Jhett and the other victims fought hard to get the justice they deserved. And they did. Canedo was found guilty and was locked up in jail. But that was not the end of the story. Jhett may have not been able to recover the money he lost to Canedo but that didn't stop him from investing again. He became a producer for Broadway plays and musicals and has won 3 Tony awards and nominated for 2 more this year. When I first met Raymond Martin, he was just training to try out for the Paralympic Games. His disability did not stop him from racing on a wheelchair. I followed his story until he eventually won 4 Paralympic Golds in London. He was also named ESPN's Paralympic Athlete of the Year and is now preparing for the Paralympic Games in 2016. I flew all the way to Tucson Arizona to look for Jessica Cox. She was born without arms but she can drive a car and fly an airplane. I found her and I followed her story through the years until she started scuba diving, surfing and eventually got married. Through the years I have covered a number of stories about Filipino victims of human trafficking — Florida 15, Boca Raton 39, Miami 161 and other individuals victimized by unscrupulous recruiters and placement agencies. The story goes like this, Pinoy wants to have a better life in America. He pays thousands of dollars worth of placement fees, immigration, airfares etc. Borrows money from loan sharks and places their property as collateral. He comes to America only to be trafficked by recruiter or employer. Loses their legal status, no job, no money, trapped in system where they now owe money and has no means to pay up, lose their property and live in the shadows as undocumented. I like stories that inspire kababayans or stories that become a teaching moment for our kababayans. The moment I wake up, usually at 7AM, the first thing I do is to look for my phone or iPad mini to see what's happening in the world via Twitter, Facebook and other social media platforms. I also scan the day's news from various sources. On Twitter I follow a good number of tweets from news sources. I turn the TV on CNN and see what's going on. I brew a cup of coffee (from either Nespresso or Keurig). Have a bowl of cereal with soy milk or almond milk. I start previewing my videos and then I write my story for the day (if it was shot the day before). Otherwise, I would be getting ready, pack my equipment and head out for coverage. Then at noon, I attend a daily teleconference with BA team to talk about the day's lineup of stories then record voice over for my edited story and write the web version of the story. Then I start scouting for other stories, call contacts, check emails for invites or head out to coverage depending on what I have scheduled that day. If I have to travel, I would be packing my bag right after finishing my story for the day and head to the next out of state coverage. What issues of our kababayans in the U.S. do you think deserve more attention from the Philippine media? I believe that there's a ton of untold stories out there from Filipinos living away from major cities in the U.S., be it a success story, a story of struggle, or an inspiring story. It's just a matter of finding them and telling their stories. Do you see yourself transferring to local news in the near future? I have not really thought about that, I guess it's because I am happy exactly where I am at right now. So where do you see yourself in 10 years? Do you see yourself doing something a bit different within the industry? What do you think is the biggest misconception about Don Tagala? I've heard some people say that I'm such a snob because I didn't say hi to them on the streets of New York or New Jersey, but I'm really kinda shy when it comes to initiating conversations. If I see Pinoys on the street I don't say hi to every single one I see, unless of course, they initiate the conversation then I would say hi and even talk to them. I also don't want to assume that everyone knows me so I don't walk around waving at everyone. Tagala during his coverage of President Barack Obama's inauguration. What can you consider the highlights of your broadcasting career? The Obama Coverage. I was with Ms. Ging Reyes in Springfield, IL when Obama announced his candidacy for U.S. presidency in 2007. I have followed Obama's story from Chicago campaigns to election night victory at the Grant Park together with more than 5K journalists from all over the world. I was also able to cover Obama's transition office in Chicago. I was also fortunate to cover Obama's inaugurations at the Washington DC Mall, both first term and second term inaugurations. The Hurricane Katrina coverage was significant too. I was also able to cover Hillary Clinton's big announcement in New York so I am hoping I'd be able to follow her story the same way I did to Obama's rise to power, and if ever she becomes the Democratic Presidential nominee. What news event do you most wish you had covered? I wish I had the chance to cover real wars in the Middle East but I also am scared because of the risks involved. You've won a number of Tellys, most recently with your documentary, Casting Call. Tell us what drew you to that project. That stuck in my mind. Years later, I moved to New York and I interviewed Sam about his plans to chase his Hollywood dreams, so I thought to myself that was really interesting — a Filipino-American born in a small town in USA, found success in his mother's homeland is now back in the U.S. chasing his American Dream. I just kept on covering his auditions and the things that he did in New York to become an actor in mainstream USA. Then boom! Why not do a documentary on a very interesting subject and a very interesting story. So the Documentary “Casting Call: The Story of Sam Milby” was born. And what subject are you planning to tackle next? I am very interested in the story of the Filipino Food Movement in the U.S. I would like to trace how the modern Filipino restaurants became quite popular in New York and in other cities. It would be nice to produce a documentary on The Filipino Food Movement in America. What are you most proud of about being a Filipino? I'm proud of the Filipino talent. Meeting and interviewing so many talented Filipinos in the U.S. in various fields make me feel so proud of our kababayans. You're openly gay and that's really admirable. Do you think we have come to the point where Filipinos are now more open-minded in seeing gays in positions of power? I have always believed that you can't argue with success. It doesn't really matter whether you're gay or straight, black or white, ugly or beautiful, short or tall, or whatever defect or imperfections you have but if you do your best and show them that you got what it takes to do your job and do your job extremely well — then your sexuality wouldn't even matter. When Anderson Cooper came out, the LGBT community already knew about it. But what he did still made a huge impact on other journalists who are gay and are not quite vocal about their sexuality on TV. I guess it made it much easier for others to come out after seeing somebody with Andy's stature to come out like it was the most natural thing to do. No fuss. I believe that it's not really about whether Filipinos now are more open-minded about seeing gays in positions of power... I think, it's more about the gay journalists or members of the LGBT community who are in positions of power now are more comfortable about themselves and are accepting and coming to terms with their own sexuality — how can others accept who you really are if you can't even accept your own self? That's what I think. "I used to be afraid of failure, but now I learned that failure is not about losing or being a loser — it's about learning from that failure so that you won't commit the same mistakes or do the same things that you did to fail." Do you think reporters who are gay should come out of the closet? Why or why not? Do you have any advice for them? I think there's a greater chance for others to accept who you are when you have already accepted who you really are. What are you most afraid of losing? My eyes, to see the videos that I shoot. My Ears, to hear the stories I cover. My voice, to tell these stories using my own voice. I used to be afraid of failure, but now I learned that failure is not about losing or being a loser — it's about learning from that failure so that you won't commit the same mistakes or do the same things that you did to fail. Failure is necessary to success. Failure is the key to success. If you feel like you need to drag yourself to to to work as a journalist, then journalism is not for you. I wake up every morning excited and happy to know that I am a journalist working for ABS-CBN News on TFC. It doesn't even feel like a job, it's really something I love and enjoy doing every single day. My advice would be, for any professions actually, is to find a job that you really really enjoy doing such that it doesn't really feel like you're going to a job, it should feel like you're just doing something that you love doing and you're making money while you're at it. And most importantly you are having fun while at work.